When MSU President M. Peter McPherson accepted the position as financial coordinator for the Office of Reconstruction and Humanitarian Assistance in Iraq, he knew it wouldn't be "a cake walk." "When they asked for information to put on my dog tag, I knew this wouldn't be a trip to the Bahamas," McPherson said. On April 25 the MSU Board of Trustees approved an unpaid leave of absence for McPherson. He left for Iraq on Thursday and was not present at the spring graduation ceremony. McPherson will serve in Iraq as the financial coordinator for 130 days, but said he plans on returning to MSU in the fall. Although his duties in Iraq will not be finished in that amount of time, McPherson said he "fully expected to get a substantial amount done." While in Iraq he will focus on strengthening and rebuilding the country's economy after Operation Iraqi Freedom. McPherson said there is a "blueprint of possibilities" for Iraq's economy, which would entail working with the financial industry within Iraq. The country's currency also will remain an important issue to address, he said. McPherson said he was excited to work in Iraq because of the "dimension of the problem" there. "I do believe a difference can be made," he said. Trustee Scott Romney said McPherson's leave shows the university's appreciation for serving others. "It's a tradition of MSU to be committed to community service," he said. During the Eisenhower administration, former MSU President John Hannah also took a leave of absence to work as the assistant secretary of defense for manpower and personnel. David Porteous, chairman of the Board of Trustees, said McPherson's appetite for international service started during his time in Peru as a Peace Corps volunteer and has continued to MSU through the university's international programs and development. In the 1980s, McPherson gained financial affairs experience as the Deputy Secretary of the Treasury for the U.S. Department of Treasury under President Reagan and chief administrator for the U.S. Agency for International Development. During upcoming months, the board will decide on next year's budget and set tuition rates. Provost Lou Anna Simon will now have "full powers of the presidency," McPherson said. 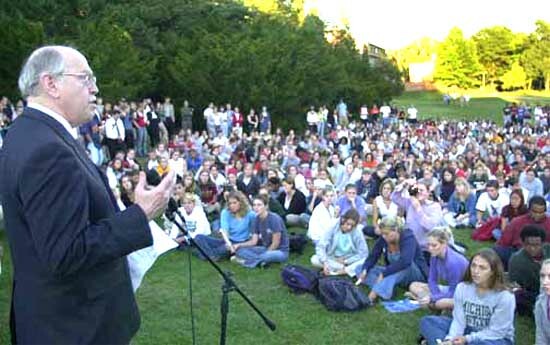 Simon has been the university provost since 1993. Simon said the budget challenges facing the university "pale in comparison" to the ones McPherson will face in Iraq, but the university will wait to make its budget decision until the state legislature finalizes it. The legislature is expected to cut funding to MSU by as much as 6.75 percent for the 2003-04 fiscal year. But McPherson said he spoke with Gov. Jennifer Granholm and mentioned how important it is to keep higher education affordable. Simon said she was anxious for McPherson's return, but said the momentum of the institution would carry on in his absence. She fully expects to keep McPherson informed on the progress of MSU during the summer. Trustee Colleen McNamara said she supports the decision to have Simon take over for McPherson. "I'm very confident we'll work with Lou Anna and move things forward," she said.